Wow, I was pretty excited when my post for No Bake Cookie Ice Cream Topping was featured over at A Thrifty Mom today. 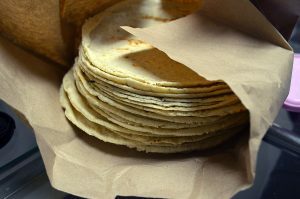 So in honor of being featured over there I decided to share the recipe for home made tortillas that I originally got from the A Thrifty Mom site. If you have never had homemade tortillas before you are missing out. Ever since trying these several months ago we have only had store bought tortillas one time, and that was cause we had to bring them to a party. Seriously they are totally worth the little extra effort it takes to make them. They also store well in the fridge, so they are great for leftovers or another meal later in the week. Oh and if they don’t roll out into perfect circles don’t worry they still taste great. Don’t ask how I know! :) Let’s just say a tortilla press is pretty high up on my kitchen tool wish list. Place the flour, baking powder and shortening in a bowl. With a fork cut the shortening into the flour until it is blended well. In a separate bowl add the hot water and then the salt. Stir to dissolve the salt. Pour over the flour mixture and knead until blended well. Cover the dough and let it rest for twenty minutes. Cut the dough into four even pieces. Divide each of the four pieces into three even pieces to form twelve small dough balls. Roll each ball into a circle and roll it out with a rolling pin(or a tortilla press) as thin as you can get it without it tearing. Cook over medium/high heat for 15-30 second on each side, or until you start to get small brown areas. Be careful not to over cook your tortillas or they will be crunchy. Enjoy!